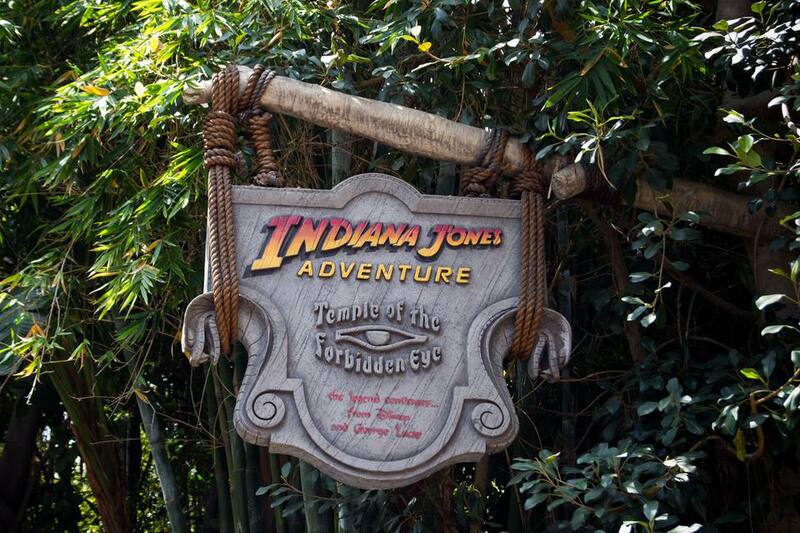 An E-Ticket tour de force, Disneyland's Indiana Jones Adventure immerses guests into the world of the popular movie series through the use of Disney's innovative Enhanced Motion Vehicles, highly elaborate sets, and a stunning array of effects. Rather than retell one of the movie franchise's stories, it creates a new plot and casts riders in leading roles. It is one of Imagineering's crowning achievements. While there are no coaster drops or inversions, the vehicles are fast, and the ride is action-packed with quick starts and stops and plenty of jostling. Also, many of the scenes are dark, and there are all kinds of dark ride gotchas, such as snakes and "poisonous" darts. Indiana Jones Adventure makes our list of Disneyland’s most thrilling rides. The attraction uses "Enhanced Motion Vehicles," 12-passenger Jeep-like cars that have onboard computers to guide them through the trackless ride. In addition to being able to independently move forward and backward, the vehicles can pitch from side to side, vibrate, and offer other movements in sync with the ride's story sequences. Fastpass is accepted and highly recommended. Indiana Jones Adventure is one of Disneyland's most popular attractions; it often has long standby lines and typically stops distributing Fastpass tickets early on high-traffic days. It's a good idea to get to the ride's Fastpass machines early in the day and reserve a spot. Indiana Jones Adventure is among the best rides at Disneyland. Getting to the nifty Enhanced Motion Vehicles is an adventure in itself. There are reasons why Indiana Jones' queue is incredibly long. For one, the ride attracts huge crowds and requires a long line to accommodate the masses. More significantly, however, the meandering passageways are necessary to move guests to the ride building that is located outside the park's original boundaries. With virtually no space to expand within Disneyland, the park built the attraction in a former parking lot beyond the Jungle River Cruise. To acclimate to the story, in which guests are cast as 1930s-era tourists visiting an ancient temple unearthed by archaeologist/action stud Indiana Jones, they move through foreboding caverns adorned with flickering lights, mysterious wall etchings, ominous spikes, even-more ominous skeletons, and other time-killing diversions. The passageway ends in a pre-show room that features vintage newsreel footage to set up the ride. It seems that Indy's excavation site has become a famous vacation spot. Tourists are flocking to see the shrine with its purported treasures and mystical powers. But, the newsreel warns (with an all-too-obvious dose of theme park ride calamity foreshadowing), visitors MUST NOT look into the eyes of the temple's idol, Mara, or an ancient curse will befall them. Hence the name of the shrine— and the subtitle of the attraction: the Temple of the Forbidden Eye. Riders board the vehicles from one of two loading platforms. The first scene takes guests into the Chamber of Destiny for a face-to-giant-face meeting with Mara. One of three doors opens, and the vehicles move toward a blinding light that is—you got it—the forbidden eye. Having triggered the curse, all hell breaks loose. Lighting crackles, snakes slither (why does it always have to be snakes, indeed), and other horrors ensue. The actual course of events differs slightly for each ride. According to Disney, the ride vehicles, which have onboard computers that independently control them through the attraction, are capable of delivering 160,000 different variations of motions and actions. The sophisticated vehicles are unlike anything that preceded them and seems to adopt a personality of their own. When they encounter the snakes, for example, they shudder and recoil in much the same way as their passengers. Amid the chaos, an old pal comes to the rescue. A startlingly lifelike animatronic Indiana Jones intercedes and attempts to direct the visitors to safety. More catastrophes unfold, however, as the vehicles traverse a rickety bridge above the lava-spewing Cavern of Bubbling Death (why does it always have to be bubbling death? ), and move into a room filled with bugs—ewww!—and a cave where poisonous darts whiz within inches of riders—eeahhh! The ride is great at using darkness and momentary bursts of light to heighten the tension and add to disorienting misdirection. The onboard audio, which includes the familiar Indiana Jones score interspersed with other original music and sound effects, also adds to the drama. Indy concludes with an incredible scene featuring the giant rolling boulder from the first movie. Even though guests rationally understand that it's a ride and that they aren't in any real danger, the effect is so well constructed, they can't help but react by ducking and thinking the ensuing boulder is going to flatten them. Spared from becoming pancakes, guests round a bend for a final sendoff from Indy. If the unload area is backed up (especially if only one side of the ride is operating on less crowded days), the vehicles linger in the last scene with the Indiana Jones character. After he says his line, it's odd to watch the animatronic Jones move repetitively and a bit awkwardly waiting for the next vehicle. There is a similar Indiana Jones attraction at Tokyo Disney Sea, the second park at the Tokyo Disney resort. That ride is called Temple of the Crystal Skull. Enhanced Motion Vehicle technology is also used in the Dinosaur attraction (formerly known as Countdown to Extinction) at Disney's Animal Kingdom.